This morning I received an email from Vicki Hollett, asking for a link to one of my favourite blogposts for an ELT Blog Carnival, and suddenly I have noticed I had stopped writing blogposts after English Cafe, in which I have created numerous lessons and blogposts, shut down two years ago. English Cafe was a very vibrant community page where I have met JenniferESL, Kenneth Beare, Jim Stroud, Holly Dilatush, Jessica, Anna Murphy and many other great teachers from other countries. Before it shut down, we had reached about one hundred thousand students, who regularly visited our website for improving their English. Before long we had become like a family sharing so many precious experiences in English. Although I was a non-native English Teacher, about 55 lessons with quizzes I had created for English Cafe have received the highest number of comments after JenniferESL’s lessons, which was such a big honour for me. In EC, I became a featured teacher, who was distinguished by his lessons based on collaboration. I interviewed many members of EC and recorded these audio sessions on skype, and I wrote stories which were read and recorded by other EC teachers and some famous authors and story-tellers such as J B Rowley, the famous Australian author. This great online journey had lasted for two years for me, and when Global English decided to close EC down, we all had been so upset and devastated. All our efforts had been wasted and we felt we were let down. There was no where to go now on this spacious earth. I felt homeless after the experience of EC for a long time. I had been one of the first people who opened a Facebook account in Turkey, but it had always been passive. I had never thought that Facebook could be a real place of education. I suddenly decided to use Facebook actively for educational purposes, unaware of the fact that I would meet great teachers with whom I would collaborate soon. I have met Jason R Levine, (Fluency MC), and we started collaborating on songs. Tom English, whom I met on English Cafe also appeared on Facebook and soon we created a group called “Learn English with Tom and Turgay.” Tom English has also read my poems into a recorder. 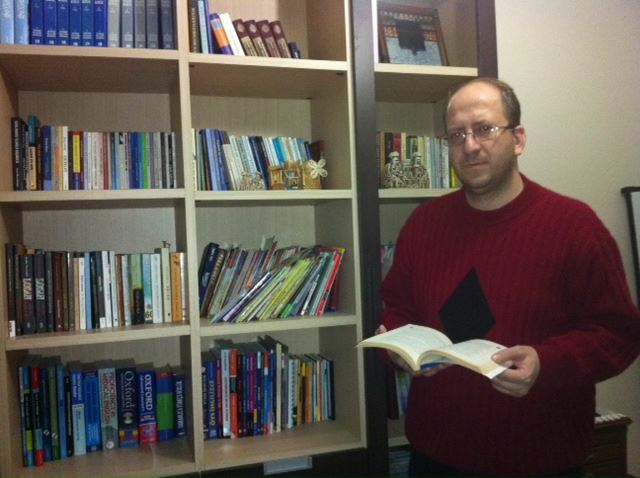 Andrea Giordano, whom I have met in Twitter has been the next great teacher, who also read and recorded many of my stories which I have written for Turkish students. Recently, I have reached the honour of knowing Vicki Hollett, whose videos and enthusiasm for teaching has always fascinated me. Vicki has also edited some stories my wife has written kindly. Honestly, being a writer who has created over 55 books in the field of teaching English, I distinguish JenniferESL, Jason R Levine and Vicki Hollet from other precious friends who create online materials since these three share the common ground of writing ELT materials with me. I had learnt how to create some primitive videos before the experience of EC. I tried to develop my skills of making videos after seeing the great videos of JenniferESL, Vicki Hollett, Jason R Levine, Mr Duncan, Rachel’s English, and other great Youtube Teachers. I focused on making better videos after the ban on Youtube has been removed in Turkey. This ban had prevented me from being one of the first Youtube Teachers. I created audio podcasts in the process of Youtube ban in Turkey. Interestingly, Youtube had been banned by some secular courts in Turkey, and the ban has been lifted by the conservative authorities. Now I was free to share my videos with more people in the world. The songs I have written and Jason has performed, have been used at many schools in different countries. When one mother sent me a message from Bangladesh, saying that her son who sang a song I have written came first in a song contest held in his school, I felt so happy. Honetly, there exist no words to describe this kind of joy we teachers occasionally enjoy. The video I shared above has been one of the most popular songs in youtube and google in the field of Present Continuous Tense despite its somewhat controversial lyrics. This helped me to see that creating content on the net requires being open-minded and acting with a consciousness of being a global player. This is a short excerpt from my online journey! I hope our journeys and individual stories will help each other to get enriched in the path of teaching and learning!